1 Porcupines are sometimes called prickle pigs. In Latin the word porcupine means "quill pig." In French the word porcupine means "spiny pig." Porcupines really aren't pigs. They are rodents. Porcupines are the second-biggest rodents in North America. 2 Porcupines have soft, fluffy hair all over their bodies. They also have quills. The quills are everywhere except on the porcupine's stomach. The quills are short and stiff. They are like the bristles on a brush. The quills have sharp, barbed tips. The tips make the quills hard to get out when they stick into another animal's skin. 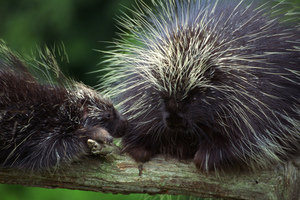 Porcupines use their quills to defend themselves. The quills lie flat until the porcupine feels afraid. Then the quills pop up. The porcupine can't shoot the quills. They come out if touched. The porcupine might also shake the quills loose. A porcupine might have as many as 30,000 quills. Porcupines grow new quills to replace the ones they lose. 3 Porcupines are good swimmers. They also like to be in trees. They have long, curved claws. These claws help porcupines be good climbers. Porcupines can smell and hear very well. Their little button eyes aren't good at seeing things.